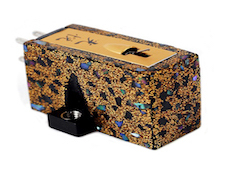 Do you remember the Koetsu Rosewood phono cartridge? Or the Kiseki Lapis Lazuli? 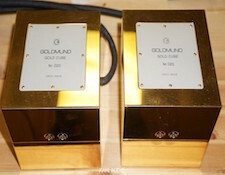 How about the Goldmund "Cube" amplifiers that featured gold-plated chassis? Or the Ongaku amplifier, from Audio Note, that had transformer windings, capacitors, and internal wiring all made from pure silver? What about those cables from Siltech that also boasted wires made from precious metals? 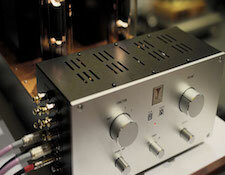 High End hi-fi is alive with exotic materials, ranging from the 99.99997% pure metals used in cables (even by XLO, my own former company) to carbon fiber connector shells, to ancient and exotic woods used for fabricating phono cartridges and acoustic horns, to many, many other applications of extreme materials to what might otherwise be considered almost mundane tasks. Other than adding to the cost of our toys, though, or to our bragging rights in having bought them (or, if we can't actually afford such things, to our unrequited lust to acquire them), do they actually do any good? Do they really add to the performance of what we buy or are they just there to be pretty and to help manufacturers sell stuff? As with so many other things, no single answer is possible. To get an idea, though, let's take a look at what all of those exotic and oh-so-expensive materials are supposed to do. There must be SOMETHING that they're there for, wouldn't you think? Otherwise why use them at all? For Hi-Fi, the range of possible uses (and therefore possible benefits) is really pretty limited and can be broken down into just a few broad categories: The first question to ask in seeking to determine WHICH of those categories materials or their benefits should be assigned to is whether the improvements they're supposed to make are to the equipment, itself, or to what the equipment DOES. If they're there to improve the equipment instead of its function, how are they supposed to do that? Besides being pretty, Chromium, gold or rhodium plating on connectors and chassis, for example, really can prevent corrosion and help keep whatever they're applied to from oxidizing and slowly either being destroyed or destroying its electrical connection to other parts of the system or to the individual component that it's part of. Even though that's a real benefit, I don't know of anything else they might do that could be considered an improvement, and some of the pretty anti-corrosive platings - nickel, for example - could, because of their other properties (nickel will take and hold a magnetic charge - as in, for example, the Alnico [aluminum-nickel-cobalt] magnets that used to be standard for use in loudspeaker drivers), actually be a detriment. Another of the very fancy and very expensive surface finishes that ― again, to my knowledge ― is just pretty and, other than being an insulator (like any number of other and far cheaper things) does nothing else at all to improve either the equipment or its performance is (except possibly for use in phono tonearms) is carbon fiber. Carbon fiber COULD possibly, because of some special rigidity or resonance-related characteristic, offer some performance benefit to tonearm designers but. If so, I have no knowledge of it. To use it as the visible outer "shell" of an AC or RCA connector, though, both of which applications are quickly becoming so common as to be almost commonplace, cannot, IMHO, do anything except add to the product's appearance and cost, and offers no performance benefit at all - especially when, as I've seen in practice, the carbon fiber is applied only as a thin "veneer" over a more ordinary substrate. The anodizing process for aluminum is something that's nowhere near as exotic or expensive (or in the case of those thin veneers, as expensive-LOOKING) as carbon fiber, but that DOES work in those connector shell applications to enhance both the connector's beauty and its actual performance. One of the things that I have been advocating since I first founded XLO more than twenty years ago was ― even despite the market triumphs of WBT with its original "half-pound" (Yeah, I know I'm exaggerating, but it's to make a point) RCA connectors ― that connectors OF ANY KIND should, for best performance, always have maximum contact area and minimum mass. The low mass requirement is to avoid self-inductance-created "eddy currents" that can interfere with the connector's ability to pass signal without restriction or modification. To my knowledge, the first connector manufacturer to either act on my advice or to have come to the same conclusions independently was Eichmann, with its very-low-conductive-mass plastic-bodied "bullet" RCA connectors. Since then, any number of other manufacturers (even WBT!) have come over to my original position and are offering low mass connectors. Most of those, however, seem to ignore or to have minimized the importance of that OTHER consideration; maximum contact area. The materials used in our electronics and the mechanical and electromechanical parts of our systems are important, and do make a difference to how they perform; to what they look like; and to how long they last. There's no magic, however: No eye of newt or virgin's blood is required and, even if it's present, it's not likely to make any difference,m except in the price of what we buy. I'll continue this series on what works and what doesn't, and why they do or don't do as claimed next time.